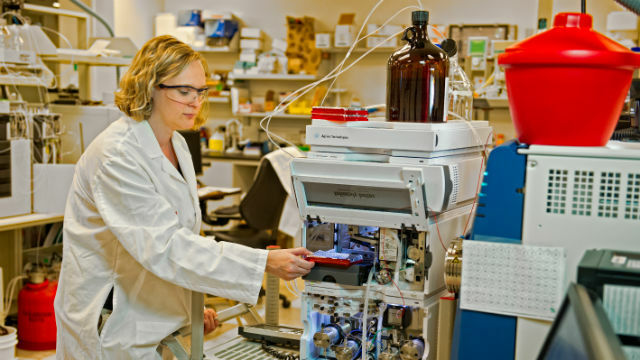 A researcher in an Eli Lilly lab. Courtesy Eli Lilly and Co.
Life sciences giant Eli Lilly and Co. announced plans Thursday to expand its Lilly Biotechnology Center near UC San Diego, effectively doubling its local research presence. Set to be completed in 2016, the expansion will create up to 130 new jobs, many for experts in biotechnology, chemistry and immunology. The company is adding 175,000 square feet of research space by taking over a nearby building being vacated by Qualcomm. “San Diego has been an important location for Lilly laboratories for more than a decade. The city is a global hub for biomedical research and talent, where collaboration between academic institutions and biotechnology thrives,” said Thomas F. Bumol, Ph.D., senior vice president, biotechnology and immunology research at Lilly. The company said the new space will allow for closer collaboration among Lilly experts in discovery chemistry, research technologies and biotechnology, fostering collaboration which will help accelerate the discovery of new medicines. Indianapolis-based Lilly initially entered the San Diego area in 2004 by acquiring Applied Molecular Evolution, which now operates as a subsidiary of the company. The Lilly Biotechnology Center was officially established in 2009 and is located on Campus Point Drive north of Scripps Memorial Hospital.